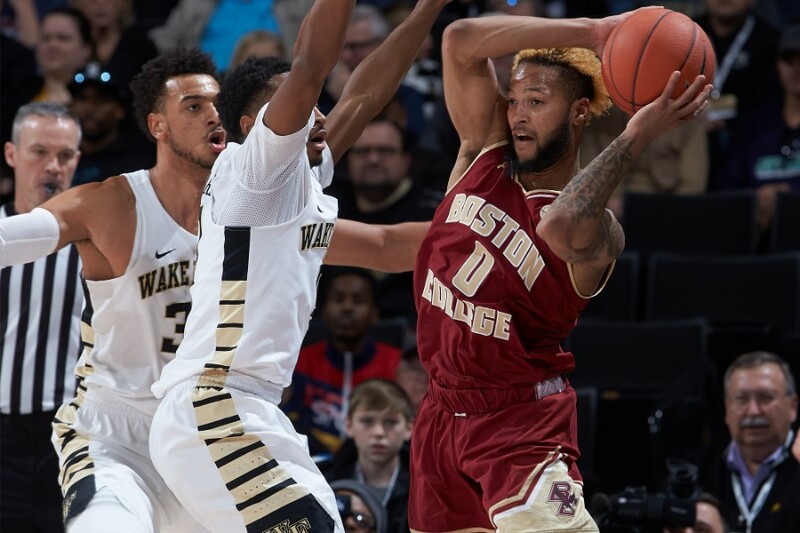 WINSTON-SALEM, N.C. — Ky Bowman drilled a go-ahead three-pointer with 15.8 seconds remaining as Boston College earned a 65-61 victory at Wake Forest Saturday afternoon at Lawrence Joel Veterans Memorial Coliseum in Winston-Salem. With the shot clock winding down, Bowman made his first three of the day to propel BC to the victory. BC earned its second straight ACC win to move to 11-7 overall and 2-4 in conference play. Wake Forest dropped to 8-11 overall and 1-6 in the ACC. The Eagles trailed for the majority of the second half before using a 13-2 run to close out the game. Boston College finished with just seven turnovers while forcing the Demon Deacons into 16 turnovers. BC held Wake Forest scoreless over the final 4:30 of the game and scored the game’s final nine points. Bowman finished the day with 14 points as three Eagles totaled double-figures. Nik Popovic led the way with 21 points (one shy of his career-high) while Jordan Chatman chipped in with 18 points for the victors. Boston College scored the game’s first eight points and led for most of the first half until the host Demon Deacons used a 10-0 run in the closing minutes of the half to take a 35-31 lead into the break. Wake Forest shot over 50% in the first half (15-of-29) and held a 23-15 advantage on the boards to take the halftime advantage. BC forced nine Wake turnovers in the opening 20 minutes of play as Popovic led the way for the Eagles with 10 points and six rebounds. Ky Bowman finished with 14 points, three rebounds, three assists and no turnovers in 40 minutes of action. He was 6-of-15 shooting from the field, including 1-of-6 from behind the arc. Nik Popovic totaled his sixth double-double of the season with 21 points and 11 rebounds. He just missed his career-high of 22 earlier this season versus Columbia. Jordan Chatman finished with 18 points and eclipsed the 1,000-point plateau for his career. Between BYU and BC, Chatman now has 1,008 career points. Chatman was 5-of-8 from behind the arc in the win. Steffon Mitchell tied his career-high with seven assists while committing zero turnovers in 27 minutes. He also added five rebounds, four points, a blocked shot, and a steal. Chris Herren Jr. earned the start in place of injured classmate Wynston Tabbs and tallied five points, two steals, and an assist. BC is 14-10 all-time vs. Wake Forest, dating back to 1980-81. In ACC play, Boston College is 11-10 against Wake Forest. +12 – Boston College outscored Wake Forest, 18-6, on the fast break. The Eagles also held a +9 advantage in points off turnovers. Nik Popovic led five Eagles in double-figures with a 26 efficiency rating. Steffon Mitchell registered a 15, while Jordan Chatman was at 12 and Ky Bowman 10. Efficiency rating is calculated using the following formula: (PTS + REB + AST + STL + BLK – Missed Shots – TO). Boston College returns home for a pair of ACC matchups next week, beginning with Syracuse on Jan. 30. Tipoff is set for 8 p.m. ET and the game can be seen live on regional sports networks. Locally, NESN will carry the game live. Tom Werme and Mike Gminski have the broadcast call on the game.